On Feb. 13, 2011, inspired by the forced resignation of Egyptian President Hosni Mubarak, peaceful democratic protests erupted in Bahrain. Protests grew and, in response, King Hamad bin Isa Al Khalifa invited other Gulf states to send security forces into the country to assist in violently suppressing the demonstrators. The March 15 invasion by Saudi Arabia and the United Arab Emirates brought an intensification of torture, secret trials, demolition of Shia mosques, and repression against human rights activists, journalists, labor, lawyers, medical professionals, students, political figures, and others. On March 18 the regime destroyed the Pearl Monument that had served as the protest center. 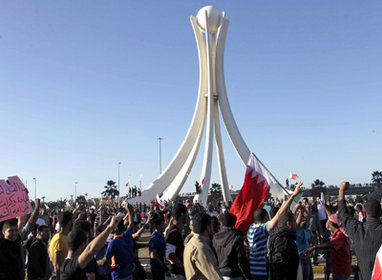 Like many other autocracies in the region Bahrain has been a key U.S. partner. It has provided a home to the U.S. Navy&apos;s Fifth Fleet, responsible for naval forces in the Persian Gulf, Red Sea, Arabian Sea, and the coast of East Africa as far south as Kenya. This is why Washington&apos;s response to the vicious repression in Bahrain has been so muted and pro-forma, in contrast to forceful denunciations of repression in countries outside the U.S. orbit, such as Iran and Libya. Richard Sollom from Physicians for Human Rights says health care workers in Bahrain have been targeted on a scale he has never encountered. Government forces have invaded hospitals; doctors have been dragged out of the operating room, abducted and detained for giving care to wounded protestors. The government says it will try 47 medical workers it accuses, incredibly, of causing the deaths of protesters by inflicting additional wounds on them. Hundreds of workers, including union leaders, have been fired for striking for democratic change. Security forces closed down the General Bahraini Federation of Trade Unions headquarters. The Bahrain Center for Human Rights writes, "Bahrain is currently considered a dangerous zone for the freedom of press and journalists." On April 3 the government suspended the country&apos;s only independent newspaper, Al Wasat. On May 2 it arrested two politicians belonging to the opposition Al Wefaq party. Bahrain&apos;s population is 60 percent or more Shia, with the government dominated by a Sunni minority. There is systematic discrimination against the Shiite majority in political representation, employment, wages, housing, and other benefits. The government has tried to split the opposition along Shia-Sunni lines, but uprising leaders insist their struggle for democratic rights is non-sectarian. Zainab Alkhawaja wrote to President Obama after her father, Abdulhadi Alkhawaja, former head of the Bahrain Center for Human Rights, was beaten unconscious in front of his family and arrested by masked men: "if anything happens to my father, my husband, my uncle, my brother-in-law, or to me, I hold you just as responsible as the Al Khalifa regime. Your support for this monarchy makes your government a partner in crime. I still have hope that you will realize that freedom and human rights mean as much to a Bahraini person as it does to an American, Syrian or a Libyan and that regional and political considerations should not be prioritized over liberty and human rights." Amnesty International, Human Rights Watch, Physicians for Human Rights, the International Crisis Group and many others have exhaustively documented the brutal terror of Bahrain&apos;s government. No further evidence is needed. As long as the repression continues, the promise to lift the state of emergency is only an empty public relations gesture. The United States should end all aid to Bahrain, condemn the invasion by Saudi Arabia and the United Arab Emirates, and sharply denounce Bahrain&apos;s horrific suppression of democratic rights. As the Arab Spring has swept through North Africa and the Middle East, the role of the United States has been truly shameful. Washington&apos;s rhetoric cannot conceal a deep fear of democracy. Its first instinct was to stand behind its old friends. Only when it became obvious that Ben Ali&apos;s and Mubarak&apos;s days were numbered were they abandoned. As for Saudi Arabia, this ultra-reactionary monarchy, with its appalling treatment of women and religious minorities, is almost never criticized by U.S. officials. There are those who, while deploring repression in Bahrain, justify continuing U.S. support for that country's brutal tyranny as "realism"; in a dangerous world, they argue, our security depends on having a Middle Eastern state willing to host the Fifth Fleet. This argument is profoundly mistaken. Interventionist naval forces are part of a foreign policy that, by siding with despots and pitting the United States against the Arab people's longing for responsible government and a better way of life, guarantees endless terrorism and bloodshed and an even more dangerous world for everyone. For good reason, democratic movements around the world today do not trust the United States, which they see as motivated by imperial interest. That is why the U.S. desperately needs a new foreign policy, one that welcomes democratic forces -- not hypocritically, in order to manipulate them and blunt their impact, but to stand in solidarity with their struggles to win political power for the people and achieve social and economic justice.